Salvatore A. Bontempo (August 14,1909 – June 20,1989) was born in Newark, New Jersey. After graduating from the University of Notre Dame and the John Marshall School of Law ( now Seton Hall University School of Law), he became active in Newark city government, serving as director of purchasing from 1933 to 1942. During World War II he achieved the rank of colonel with the Army Air Forces. He was elected to the Newark City Commission in 1953. The campaign button was likely from that time period. From 1958 to 1961 he served as New Jersey’s Commissioner of Conservation and Economic Development. In that position he led a drive for development of the New Jersey Meadowlands and also worked to preserve open space by acquiring land through the state’s Green Acres program. In 1961 he briefly served in the State Department as administrator of Security and Consular Affairs, after which time he left to work in the private sector. 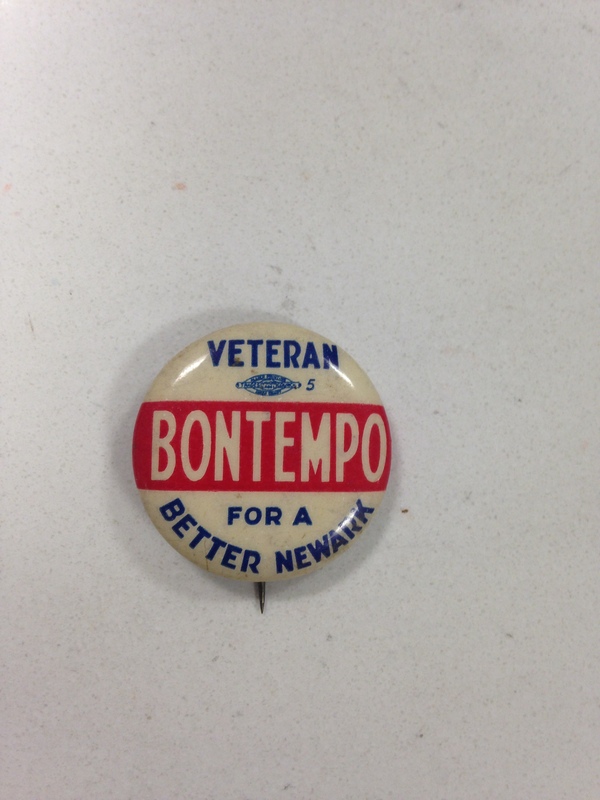 In 1969 Bontempo was elected chairman of the New Jersey Democratic State Committee. In the 1972 Democratic presidential primaries, he supported Hubert H. Humphrey, who lost New Jersey by a huge margin to George McGovern . He left the party chairmanship in 1973. From 1975 to 1977 he served as chairman of the New Jersey Highway Authority, overseeing the Garden State parkway and the Garden State Arts Center ( now the PNC Arts Center). He died of cancer in 1989 at the age of 79 at his home in Florham Park, New Jersey. Mr. Bontempo was the owner of Braidburn Country Club in Florham Park, NJ. I was a member back in the mid 80’s when the club was sold and the new owners wanted to charge the current members with another membership fee. Mr Bontempo was a great guy.